This article is about the expression. For the hot beverage, see coffee. For the container, see coffee cup. For the play, see A Cup of Coffee. Baseball pitcher Joe Nuxhall made his debut at age 15 via a cup of coffee with the 1944 Cincinnati Reds. A "cup of coffee" is a North American sports idiom for a short time spent by a minor league player at the major league level. The idea behind the term is that the player was only in the big leagues long enough to have a cup of coffee before being returned to the minors. The term originated in baseball and is extensively used in ice hockey, both of whose professional leagues (MLB and the NHL) utilize extensive farm systems; it is rarely used in basketball or American football since neither the NBA nor NFL have implemented a true farm system. One well-known variant of the cup of coffee is the September call-up, in which major-league clubs call up additional players to the big leagues from the minors on September 1, when rosters expand from 25 players to 40. This is by definition a cup of coffee, because September is the last month of the baseball season. Notable players who made their debuts in September include Baseball Hall of Fame players Mike Piazza (21 games for the Los Angeles Dodgers in its 1992 season),  and Ryne Sandberg (13 games with the 1981 Philadelphia Phillies). Francisco Rodríguez made his big-league debut by pitching 5​2⁄3 innings in September for the Anaheim Angels. Included on the Angels' postseason roster as a replacement for an injured player, he won five playoff games for Anaheim and helped them to a victory in the 2002 World Series, all before he won a regular-season game in the majors. Another famous baseball player who made his debut with a cup of coffee was Shoeless Joe Jackson, who played five games in 1908, five more in 1909, and twenty games in 1910 before finally making the bigs for good in 1911. Walter Alston. Alston struck out in his only career at-bat for the 1936 St. Louis Cardinals. He would go on to manage the Dodgers for 23 years in Brooklyn and Los Angeles, winning seven pennants and four World Series championships. He entered the Baseball Hall of Fame in 1983. Joe Nuxhall. Nuxhall appeared in one game for the 1944 Cincinnati Reds at the age of 15, during a time when the manpower requirements of World War II were making it more challenging for Major League clubs to fill out their rosters. Besides, Nuxhall is the youngest player ever to appear in a big-league baseball game. He then came back to the majors in 1952 and had a 14-year playing career, and spent the rest of his life as part of the Reds broadcast team. Detroit Tigers replacement team. When Ty Cobb was suspended for fighting a fan in the stands, sixteen members of the Tigers voted to go on strike in support of Cobb. Unable to field a team for their May 18, 1912, game in Philadelphia, the Tigers scrounged up nine replacement players from around the city. Philadelphia drubbed the replacement Tigers 24–2. Pitcher Allan Travers went the whole game for Detroit, giving up 24 runs (a modern-day record), 14 of which were earned. Of the nine replacement players, the only one to ever appear in a big-league game again was Billy Maharg, who made it back for one more game in 1916 (and later was one of the fixers behind the Black Sox Scandal). The real Tigers, threatened by American League president Ban Johnson with lifetime bans, came back for their next game. Eddie Gaedel. Gaedel, who was three feet, seven inches tall, was put on the roster of the 1951 St. Louis Browns by maverick owner Bill Veeck and sent into a game as a pinch-hitter on August 19. His uniform number was 1/8. The promotional stunt ended when pitcher Bob Cain, throwing at the smallest strike zone of all time, walked Gaedel on four pitches. Major League Baseball voided Gaedel's contract the next day and he never appeared in a game again. 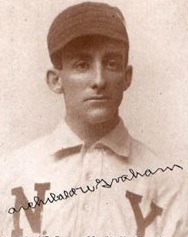 Outfielder Moonlight Graham's cup of coffee with the 1905 New York Giants was made famous by Field of Dreams. Adam Greenberg. Greenberg was a Chicago Cubs farmhand who got called up in 2005. In his big-league debut, on July 9, Greenberg was hit in the head with the first pitch he ever saw in the majors. Seven years later, and after an online publicity campaign on his behalf, Greenberg got another at-bat as a member of the Miami Marlins. He struck out swinging. Fred Van Dusen. Van Dusen was a September call-up for the Philadelphia Phillies in 1955. In his first plate appearance as a pinch-hitter, he was hit by the third pitch he saw. He never made it back to the majors. With Greenberg getting his first official at-bat, Van Dusen is once again the only player to be hit by a pitch in his only major-league plate appearance, and to never play the field. Bumpus Jones. Jones made his major-league debut on October 15, 1892, the last day of the season, for the Cincinnati Reds. Jones threw a no-hitter. He pitched in twelve more games in 1893 and then was gone from the majors forever. Mark Kiger. Kiger is the only player to have only appeared in a playoff game and never in the regular season. He made his debut with the Oakland Athletics during the 2006 ALCS and only played two games at second base as a defensive replacement. He never got an at-bat. Since he was only in the playoffs, Kiger is extremely difficult to find in baseball encyclopedias. Raúl Mondesí briefly held this distinction in 2015, but later made his regular season debut on July 26, 2016. John Paciorek. Paciorek played one game with the 1963 Houston Colt .45's on the last day of the season. He came to the plate five times, and did the following: two walks, three singles, three RBI, four runs scored, career batting average and on-base-percentage of 1.000. Of the 27 players in MLB history with batting averages of 1.000, Paciorek is the only one with three at-bats. Larry Yount. Yount, the brother of Hall of Famer Robin Yount, appeared in a game without ever appearing in a game. He was summoned from the bullpen to pitch the top of the ninth inning for the Houston Astros on September 15, 1971. Yount hurt his elbow while warming up and was removed from the game before ever throwing a pitch. He never made it back to the big leagues. By official rule, pitchers who leave the game due to injury after being announced are credited with a game appearance; thus Yount is listed as playing in one game despite never actually doing so. Ron Wright. Wright appeared in one game for the 2002 Seattle Mariners. In that game he accounted for six outs by striking out, hitting into a double play, and hitting into a triple play. Oscar Taveras. Taveras, considered a top prospect, had two cups of coffee with the St. Louis Cardinals during the 2014 season before dying in an automobile crash at the end of the season. John LeRoy. LeRoy pitched one game with the Atlanta Braves on September 26, 1997, throwing two scoreless innings, giving up one hit and three walks while striking out three more and picking up the victory against the New York Mets. On November 18, 1997 he was selected by the Tampa Bay Devil Rays in the expansion draft. LeRoy never played for the Devil Rays, and died on June 25, 2001 in Sioux City, Iowa after suffering a heart attack and brain aneurysm. Players who play only a few games in the National Hockey League and spend the rest of their careers in the American Hockey League or other professional leagues are common in professional hockey. Goaltender Tyler Weiman's cup-of-coffee with the 2007–08 Colorado Avalanche included 16 minutes of playing time. A special case unique to the NHL is that of the emergency backup goaltender. NHL rules dictate that a team carry at least two goaltenders in every game; however, there are sometimes circumstances (such as a short-notice trade or a mid-game injury) when a team only has one goaltender on the roster and does not have time to call up another from the AHL. In such a case, any goaltender 22 years of age or older can be signed as a free agent to a short-term contract to fill the second goaltender position until a more permanent solution can be found. Since the other goaltender is certain to play the game in question and is not likely to be injured during game play, the backup goaltender is likely never to set foot on the ice during game play. Thus, players with little to no experience can sometimes have a short cup of coffee in the NHL (video technician Ryan Vinz is one such example; he was pulled out of the stands to fill the position for one game for the Buffalo Sabres in 2014 despite not playing goalie since high school). This position is typically held by an older, retired goaltender (Dwayne Roloson, Artūrs Irbe and Bob Essensa, for instance, served in those positions for games in the 2014–15 NHL season). ^ Whatever happened to Larry Yount? ^ Neyer, Rob. Rob Neyer's Big Book of Baseball Lineups. 2003, Simon and Schuster, ISBN 0-7432-4174-6, p. 104. ^ ESPN News Services (October 26, 2014). "Cardinals OF Taveras killed in crash". ESPN.com. Retrieved October 26, 2014. ^ "Atlanta Braves at New York Mets Box Score, September 26, 1997". Baseball Reference. Sports Reference LLC. Retrieved 24 January 2019. ^ "Welcome to the NHL, Ryan Vinz | Artvoice Daily". blogs.artvoice.com. Retrieved 2014-03-01. ^ Peters, Chris (November 2, 2014). "Retired NHL G Dwayne Roloson steps in as Ducks' emergency backup". cbssports.com. Retrieved November 3, 2014. ^ Hoppe, Bill (November 19, 2014). Brian Gionta's first goals lead Sabres past Sharks. Olean Times Herald. Retrieved November 19, 2014.